Although it has been a few weeks since the course has been open for play, the wheels are still turning out here in the Turf Department. So let's get right to it! 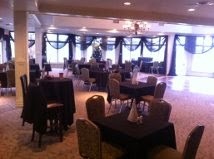 As you can see, this is a picture of our beautifully decorated banquet hall. Which on November 25th, served host to zero guests for our annual Public Meeting to present our IPM Annual Report for 2013. The theory behind these meetings was to inform the public as to the products and quantities of such products that are applied to the golf course each year. Unfortunately, the public has not supported these meetings, and despite the costs associated with advertising and running these meetings, we are still required by law to hold them. At the end of the day, if anybody has any questions regarding the use of Pest Control Products on the golf course, my office door is wide open; come on in. I am in the midst of completing the other large portion of the IPM program desk audit that is required yearly, and this keeps me glued to my computer for a good chunk of time. It has been quite chilly, in fact a little cooler than we are seasonally accustomed to. 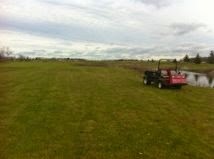 However, we have continued to pick away at some projects out on the course. The first area we tackled was behind 8 tee, where the shrubbery had taken a beating during the post Labour Day storm that rolled through the property. At the same time, Jimmy and I, with the help of an extended pole saw, managed to trim up most of the limbs and over growth along the ditch between 2 and 17. This saw was great as it allowed me to get rid of quite a few over-hanging branches, that seemed to get in the way of the odd tee shot on 17. 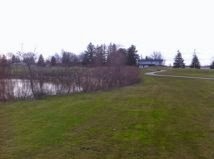 We have also started trimming some of the weak trees that have begun to line our ponds over the years since construction. You may have noticed that we cleaned out a pile of these scrub trees at the pond on 6 this year, as well as a big one next to the 13th green. As you can see, it is much cleaner, and looks the way that Mr. Muylaert had intended. We will continue to pick away at the things on our to-do lists. 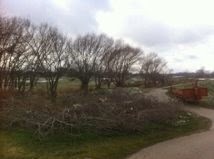 We are hoping to clear the fence line down #7, and perhaps clean some creek banks and other over grown areas on the course. We still have many indoor projects such as painting of all course materials, refurbishing benches, ball washers, and other items, and of course, dealing with the white fluffy stuff as it arrives; there is never a dull moment!